Members of the Downtown Fort Lauderdale Civic Association have concerns about the area’s traffic congestion — and they’ll soon take those concerns to City Hall. Stanley Eichelbaum, the group’s president, recently made a presentation designed to bring attention to concerns over pedestrian safety in the area on Las Olas Boulevard from Andrews Avenue to Federal Highway. “Anybody who walks [along] Las Olas,” Eichelbaum said, “knows the problem. Eichelbaum and other members maintain the problem is in the sheer density of residency downtown, coupled with the number of tourists and other pedestrian traffic. So for the past three months board member Ron Centamore has researched the issues and created a report that the group will present to the City Commission. The report also mentions the area’s need for raised crosswalks, pedestrian islands, and curb extensions at intersections, according to Centamore. Locals aren’t the only ones noticing Fort Lauderdale’s bustling downtown. Livability.com has ranked downtown Fort Lauderdale at No. 7 among the Top 10 Best Downtowns in the nation. It’s the first time Fort Lauderdale has made its annual list. While the Sunday Market on Las Olas has become a community gathering spot for nearby condo residents, promoters envision it bringing more visitors and increased weekend buzz to downtown. The market moved to the YOLO restaurant parking lot in March and this month began expanding into the adjacent block of Southeast Fourth Avenue and the Bank of America plaza. While many green markets in the region have shut down for the summer, the 9 a.m.-to-3 p.m. Las Olas market is a year-round affair that recently added musical entertainment. The market has been attracting about 1,500 people in recent weeks, with about twice that many showing up before the snowbirds left, according to organizers. About 30 vendors have been present in recent weeks and there’s room to add another 20. Patrons have their pick of produce, pastries, jewelry and various other foods and sundries. “It’s like a meeting place and a gathering place. It’s a social scene,” said Tom Ignizio Sr. He lives in the Las Olas Grand condominiums on the New River a block in from the boulevard and raves about the market’s selections. The Downtown Fort Lauderdale Civic Association took over the market in April and moved it a half-mile west from its previous location in the Las Olas Chemist-Pharmacy parking lot. Association President Stan Eichelbaum said the new location has more parking availability and is closer to the downtown high-rises. Eichelbaum is working on growing the market beyond its already expanded borders and sees it becoming a major downtown destination. “The goal is to be a regional-scale market, what could be termed a festival every week,” Eichelbaum said. Portland, Ore., is a model, he said. Its farmers market has grown to more than 250 vendors at six sites in the city’s urban core, with vendor sales totaling more than $6 million annually. Eichelbaum said the Las Olas market offers great opportunities for start-up businesses, such as Little Lola’s Pastry Parlor, which owner Diane Marquardt named for her 5-year-old granddaughter. Marquardt got a license to cook out of her Pompano Beach home in February and set us shop at the market in April. Her banana-nut breads and pecan pies have been doing exceptionally well, she said. A farm in the heart of Downtown Fort Lauderdale? It will happen every Sunday from 9 AM until 3 PM. The year-round, new expanded and improved Las Olas Sunday Market will now be held on the Plaza at YOLO on E. Las Olas at Fourth Avenue under the sponsorship and coordination of the Downtown Fort Lauderdale Civic Association. 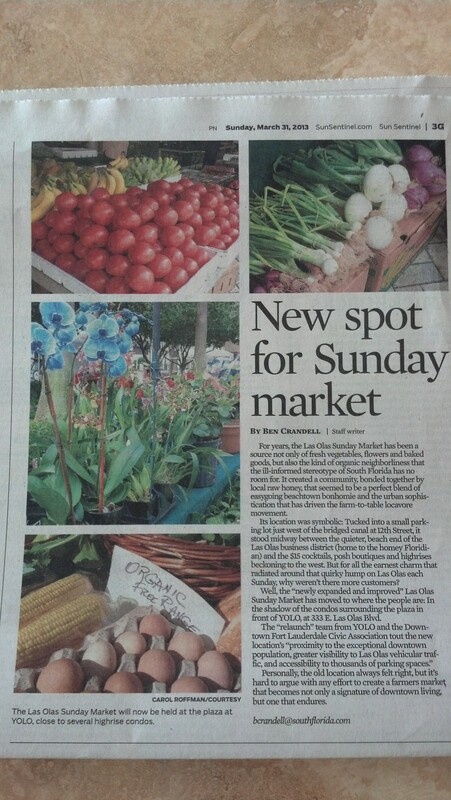 Every Sunday shoppers will be able to purchase from a variety of vendors. From flowers, baked goods and produce to paella, biscottis and Provence pottery, a large gathering of diverse vendors will offer their products. Five arrays of baked good delights….organic produce…conch and smoked fish…from honeys and nut butters to tomato sauces…over 30 Vendors are confirmed for the first week with strong expansion projected in the next 60 days. Mayor Jack Seiler and other community leaders will cut the ceremonial Grand Opening ribbon at 10:30 AM this Sunday following a celebration breakfast at Yolo for Downtown Fort Lauderdale Civic Association members and dignitaries. Many successful urban areas worldwide including in Portland, Oregon; Pensacola, Florida; New York City, Rio de Janiero and Sao Paulo, Brazil and Buenos Aires have garnered the exceptional economic catalyst and livability benefits from downtown market initiatives. The Downtown Fort Lauderdale Civic Association’s goal is for Fort Lauderdale to join the list of communities benefiting from a signature marketplace! The new market will be more proxiate to the exceptional downtown population densities and to tens of thousands attending frequent downtown activities from Sunday morning religious services to art fairs, Jazz Brunches and other festivities. The new location also provides greater market visibility to Las Olas vehicular traffic and extraordinary accessibility to thousands of parking spaces. In all cities with a strong urban market, they are also strong tourists attractions. The Downtown Fort Lauderdale Civic Association with membership now exceeding 200 is committed to making the extraordinary downtown neighborhood better and better. The organization, beyond ongoing focus on community safety and livability, also is strongly focused on the connectivity of residents to the commerce offerings of the neighborhood. The group also offers frequent forums on community and societal issues. The Downtown Fort Lauderdale Civic Association is coordinating a long term business plan for the Sunday Las Olas Market to assure its great potential.